1. A ramp for unloading a moving truck, has an angle of elevation of 30°. If the top of the ramp is 0.9 m above the ground level, then find the length of the ramp. 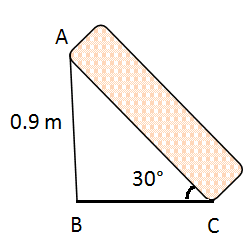 In any right triangle, the side which is opposite to 90 degree is known as hypotenuse side, the side which is opposite to θ is known as opposite side and the remaining side is known as adjacent side. 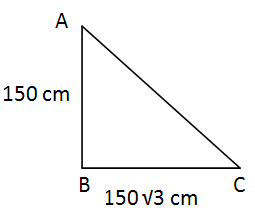 In the given problem,we have to find the length of hypotenuse side and we know the length of opposite side. 2. A girl of height 150 cm stands in front of a lamp-post and casts a shadow of length 150 √3 cm on the ground. Find the angle of elevation of the top of the lamp-post. 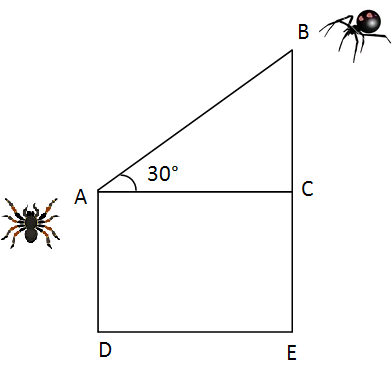 In the given problem,we have to find the angle inclined C.
In the given problem,we have to the length of AB.